Kevin Short, also known as Kevin Lee Light but best known to West Hollywood residents and visitors as WeHo Jesus, has died. Brian Hamilton, a friend and neighbor of Short, confirmed his death in a post on Facebook this evening. The cause of death has not yet been made public. A member of Short’s family told WEHOville that he died on Dec. 13 and that his family, which lives in Pasadena, received his ashes today. 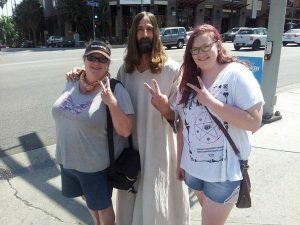 WeHo Jesus posing for a photo with WeHo tourists (Instagram). “Kevin is such a celebrity on Sunset Boulevard that he has featured in Lana Del Rey’s music videos and rock band Aerosmith even wrote a song, ‘Street Jesus,’ about him,” The Independent said. Short, 57, was an actor and has appeared in several award-winning comedic public information videos produced by the City of West Hollywood. The video below is from the second episode of the city’s “The WeHoans” series. He kept his life very private, leaving some people to speculate that he comes from a family of wealth. “He seems to make his way to concerts, sporting events and cultural events regularly,” said the story about him on Thrillist, “and — though he dresses like the world’s most famous poor man — by all accounts he’s doing pretty well, since he drives a Mercedes and has appeared in multiple videos by (of course) LMFAO.” LMFAO is an American electronic dance music duo. Photographer Roo Lewis, whose encounter with Short was the subject of The Independent’s story, said “I spent around eight hours with Kevin roaming an empty Rodeo Drive in Beverley Hills, eating pizza in The Rainbow, Sunset Strip and drinking tea in The Standard, West Hollywood, all between the hours of 11 p.m. and 7 a.m.
Short’s parents were not available this evening to comment on their son’s death given that they had just received his ashes but agreed to share more details of his life later. Kevin represented what was both weird and wonderful about West Hollywood; he was a good humored messiah with a message of love and compassion. Kevin really belonged to everyone; his loving spirit was always a comfort and his love and commitment to West Hollywood and all of the souls in it was unshakeable and total. Kevin was always up front that he was an imposter; he never said he was Jesus but he allowed all us, including us pagans, to channel His the love. We have lost a friend as well as an icon. Don’t worry. He’ll be back on Easter. In a city of Angels, whose ethics, morals and values are questioned and ridiculed the world over, a simple man walked. Who, among us, didn’t stop, notice and do a cartoon double-take whenever we saw him? And I bet many, like I, often smiled, at the irony. As Winston Churchill might have said had he driven past him on Sunset, Fountain or Santa Monica: He was “a riddle wrapped in a mystery inside an enigma.” He will be sorely missed. RIP Kevin Jesus. My son met Kevinnwhen he was 5 and they engaged in probably 15 minutes of theology discussion that started with, “Whoa! are you the real Jesus?! ?” Kevin did not miss a beat and replied something like “There is a little of the real Jesus in all of us.” It was a great interaction and Kevin was so kind and accepting!!! He will be missed by so many! Kevin has met Jesus Christ, the faithful witness, the firstborn of the dead, and the ruler of the kings of the earth. So sad to read this. Kevin passing you on the street in his long plain flowing garb was always a moment of pause, amazement and delight. He was gentle and unassuming. He will be very missed. Losing Kevin is heart breaking. It’s hard to fathom not running into him around town. He was kind, gentle, caring and, oh, so decent, smart and witty. He had a way of reflecting back the best in each of us… and reflected the best of WeHo to every visitor he encountered. So many will feel his loss personally and the community as a whole has lost its beloved WeHo Jesus. Rest in Peace, Kevin, you will be sorely missed, but will forever remain part of the heart and soul of WeHo. My most sincere condolences to his family – please know what a positive impact he had on so many people. And how much he was loved. Kevin was a part of the very colorful city we call home. Sad to lose our Jesus and some of the flavor that makes up our rainbow.. God bless. It’s a great treasure to have certain people that make the Weho experience one of happiness. Weho Jesus was one of them. He was one of the first of these characters I saw when i moved here years ago. I don’t know a Weho without him. I was not friends with him, but of course met him many times. When I first saw him, I think I feared him a little bit, as I thought maybe he was gonna start pounding the bible into my head. He was the opposite. He tried to pound love and acceptance into our heads. I will miss his visibility in our city. He certainly was loved and will be remembered by so many. I feel a tremendous loss. He was so much a part of our neighborhood – he always made me smile and was the nicest person. This news is very sad and if there is any service held, please make that info public so all can attend. I know nothing of his family or personal life…I hope knew and knows how greatly he will be missed and is loved by many many people. I think I need to go and have a good cry. I am beyond saddened to hear he is gone. I can say that I had the privilege to have met him during my time living in LA. My memory will always be this: I was walking down Sunset blvd in weho when I spotted him sitting outside the coffee bean. I went in ordered my drink and when it was ready went out and surprisingly, he welcomed me to sit with him. We ‘toasted’ each others drinks as I said ‘l’chaim!’ since ya know Jesus was a Jew. He asked me, ‘are you Jewish?’ to which I responded ‘No, but I thought you were!’ He then told me his name was Kevin, which is when I realized he wasn’t some crazy dude who thinks he’s Jesus. I told him I was headed to church soon and he was welcome to come along (i’m Christian). He told me he had other plans but asked me about my church (Reality LA) and we talked for sometime. Of course those who have ever met Kevin, or who have seen him around their neighborhood, knew he wasn’t the real Jesus. But if Jesus is anything like we are told he is, Kevin tried to represent that. In a day where religion has either separated people, caused people to play God (in their own mind), or is more about judging one another, than loving one another, it was always a delight to see Kevin marching In The Pride Parade. He represented the love of Christ, and the acceptance of everyone. That’s why he was admired so much. He represented what Jesus was really about. Just loving people, and taking time for them. Taking time to listen to them, giving them a hug, or just taking a picture with them. Even if he was just playing a role, it brought hope to people. And it brought an example of what love should look like. I’ve always said the greatest commandment we are taught is, That we are to LOVE one another, not judge one another. Just yesterday I walked past his Garden of Eden at the corner of Fountain and Laurel and it has been decimated. The timber bamboo and Mexican Weeping bamboo ripped out… Very sad, and now this. Kevin was pretty fab. Sorry to hear this. Rough times on Laurel.